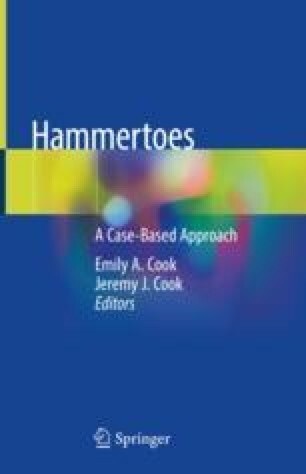 Digital deformities and hammertoe may present in a variety of forms and may be one of the most challenging surgical procedures for the foot and ankle surgeon to obtain reliable, predictable, and reproducible results. Typically the underlying pathology is associated with an imbalance of the tendons that insert into the toes resulting in subsequent secondary changes in digital deformities and hammertoes. The result of this tendon imbalance often will develop soft tissue contractures leading to a variety of deformities in the sagittal, transverse, and frontal planes. When evaluating digital deformities and hammertoes, rarely present is an osseous pathology identified at the proximal, middle, or distal phalanx. Typically it is a soft tissue contracture which causes the hammertoe or digital deformities in the sagittal, transverse, and frontal plane; therefore, tendon transfers can be utilized in the correction of flexible, semirigid, and rigid digital deformities. Flexor substitution, flexor stabilization, and extensor substitution/recruitment deformities are well-known mechanisms in development of digital deformities and can be corrected through tendon transfers. The modification of the Hibbs procedure as well as a modification of the Taylor-Girdlestone procedure is indicated for surgical correction of digital deformities and hammertoes. Unlike arthroplasty and arthrodesis procedures, this method corrects the underlying pathology and does not require any fusing, shortening, or resection of the bone from the proximal, middle, or distal phalanx or of the given joint or joints, therefore maintaining the cubic volume of the bone and maintaining continued stability within the digits. These procedures address the underlying pathology and balance the toes, therefore decreasing the likelihood of reoccurrence. Additionally, it is more patient and surgeon friendly. The incision sites are better placed for improved cosmesis. The postoperative edema is markedly reduced when compared to the osseous digital procedures as the surgery does not invade the bone. There is no shortening or instability of the toes as the medial and lateral collateral ligaments are left intact limiting the chance of rotation or transverse plane complications. The modification to the Hibbs (extensor tendons) and Taylor-Girdlestone (flexor tendons) procedure produces reproducible, long-term correction with minimal complications.